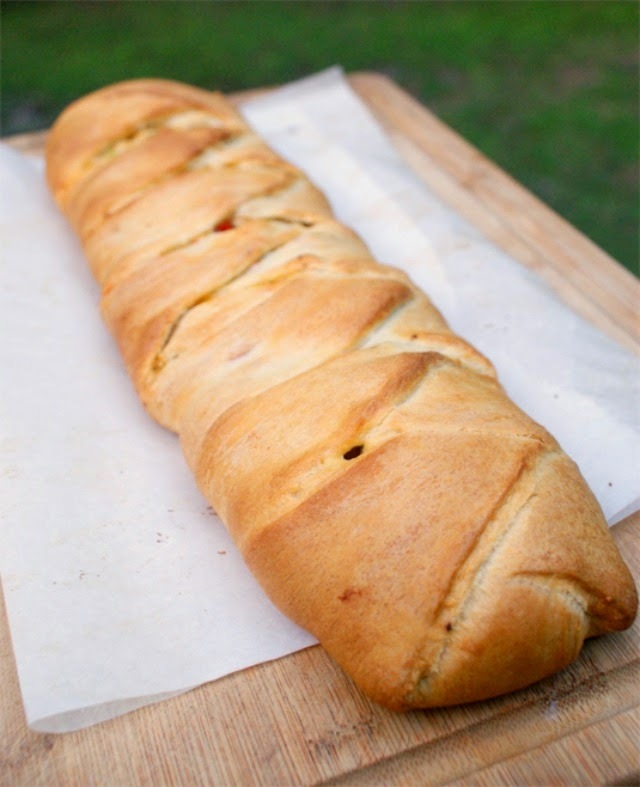 This Broccoli Chicken Braid is a gorgeous braid made with overlapping crescent rolls filled with a cheesy chicken and broccoli mixture. Plain old chicken and broccoli sounds pretty unglamorous if you ask me. Stuff that same chicken and broccoli into a braid of crescent rolls and an otherwise dull meal gets an instant face lift. There's just something about the pretty presentation that makes the meal seem more fun! It may look complicated, but it's super easy. Follow my simple instructions and turn your dinner into something special tonight! In a small nonstick skillet, saute the bell pepper, onion and garlic in the olive oil until soft. In a large bowl, combine the chicken, broccoli, bell pepper, onion, garlic, cheese, mayo, lemon zest, salt and nutmeg. Set aside. Line a cookie sheet with parchment paper (parchment paper helps to keep the bottom from burning). 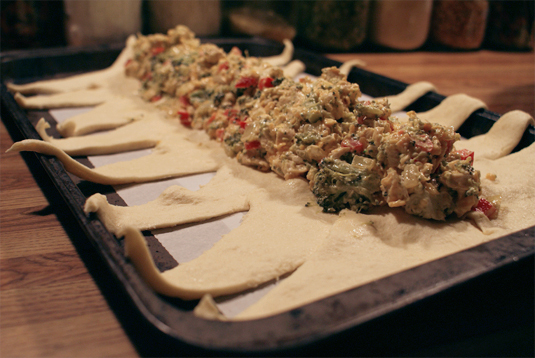 Unroll the crescent dough and separate into 16 pre-cut triangles. Arrange the crescent rolls on the cookie sheet with the wide edges of each triangle overlapping in the middle, 8 crescent rolls on each side of the pan. Pinch the seam together in the middle. Spoon the chicken mixture down the center of the crescent rolls. Fold the crescent rolls over the filling, alternating from side to side to form the "braid". 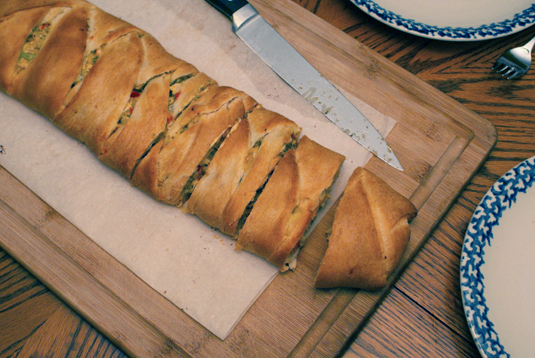 Source: Adapted from The Pampered Chef's Broccoli Chicken Braid. Oh, my! This looks amazing! I just jotted down the ingredients to add to my shopping list. This is definitely on next week's menu!